Voters rejected former President Mahinda Rajapaksa’s prime ministerial bid yesterday, routing his party in a tight electoral contest and issuing a fresh mandate to the coalition that defeated him in January to carry forward democratic reforms, reconciliation and anti-corruption efforts. Monday’s Parliamentary contest crawled to a nail-biter of a finish yesterday, with both main parties neck-and-neck until the UNP pulled off wins in the large electoral districts of Gampaha, Colombo and Kandy to clinch the race and win the most number of seats in Sri Lanka’s new legislature. The parliamentary race ended according to pre-election forecasts, with neither party winning an outright majority, but the UNP registering a slight edge over its rival UPFA. The UNP outpolled the UPFA, winning 11 out of 22 districts, with the TNA outpolling both parties in three districts of the North and East. The UNP managed to secure 93 seats in the district-wide vote, with the UPFA trailing slightly behind with 83. The Tamil National Alliance picked up 14 seats by winning big in the Northern Province districts. The surprise result from Monday’s poll was the JVP that was widely forecasted to poll between 10-15 seats, but won only four MPs . The Elections Commissioner allocated 29 national seats between the four parties based on their national percentages of votes won in Monday’s poll. The UNP obtained 13 national list slots, bringing its total to 106, just seven seats short of a simple majority in the House. The UPFA was allocated 12 slots, giving the party a 95 seat total in the new Parliament. The JVP and the TNA were allocated two national list seats each, giving them a final tally of six and 16 seats respectively. 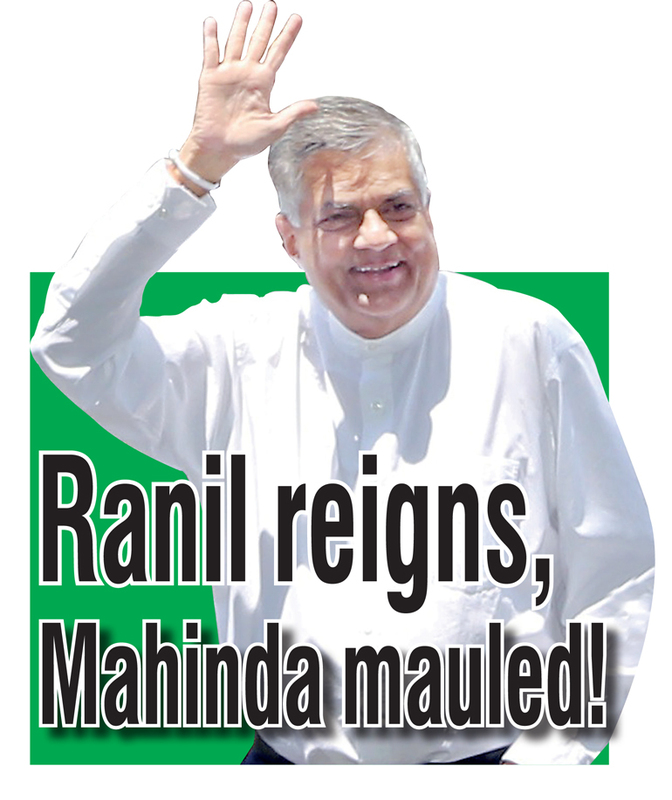 The UNP has failed to secure a majority and will be compelled to launch coalition talks but the party’s win is seen as the country’s second rejection of Mahinda Rajapaksa in seven months. UNP Leader and incumbent Ranil Wickremesinghe will be sworn in as Prime Minister once the Government is formed. President Maithripala Sirisena’s loyalists within the UPFA are expected to defect and help the UNP to form a National Government. “We need not be divided as winners and losers any longer. We should unite as sons and daughters of our motherland to the task of building a new political culture in this country,” Wickremesinghe said in a statement claiming victory for the UNFGG last morning. The SLFP led UPFA took major electoral hits in districts across the country, and the party saw support dipping even since the January poll. The UNP made significant gains since the 2010 parliamentary poll, more than doubling their number of seats in Monday’s election. Mahinda Rajapaksa, leading his party in an electoral contest seven months since he was ousted in presidential polls in January, failed to win enough seats to make his prime ministerial ambitions a reality. Rajapaksa who made much of his 5.8 million voters in the presidential race, found his support dipping to 4.7 million or 42.38% of the national vote. The UNP did marginally better with approximately 5 million or 45.66% of the islandwide vote to claim victory in the election. The former President conceded defeat at dawn in an interview with the AFP news agency. “My dream of becoming prime minister has faded away,” Rajapaksa told AFP in an early morning phone interview. “I am conceding. We have lost a good fight,” he told the French press agency. But he changed his mind a few hours later, saying he would prefer to comment after the final official results were released by the Elections Department. In his second interview with the Reuters news agency, Rajapaksa admitted the UNP was leading in early results, making it increasingly unlikely that he could form the Government. “We may not have won this battle but we will never stop fighting for our country,” Rajapaksa’s son Namal who contested in the Hambantota District conceded late afternoon yesterday after the official results were released. Rajapaksa contested in Kurunegala, Sri Lanka’s third largest electoral district with its 1.3 million voters and a region filled with soldier families. The former President campaigned hard on his national security credentials and dire warnings about a LTTE resurgence in the North, but his presence made little impact in the final analysis. The UPFA polled only, to claim a single addition seat, finishing with 8 seats against the UNP’s 7. In the 2010 parliamentary election, the UPFA won 10 seats while the UNP could only secure five, with one seat in the district won by the JVP. In the 2015 presidential poll, Rajapaksa won the Kurunegala District with an 80,000 vote margin over his rival Maithripala Sirisena. But in Monday’s poll, the UPFA only managed 32,849 votes more than the UNP in the district indicating a significant erosion of support for the former President since January. Member of the Education Renaissance Programme collective Upul Wickramasinghe, a political activist and observer in Kurunegala, said Rajapaksa’s waning fortunes in the district may have been due to tensions between the former President and his successor Maithripala Sirisena, who was adamant not to appoint Rajapaksa as Premier, even if the UPFA secured a majority in the election. “The JVP also ran a strong anti-Rajapaksa campaign in the district, emphasising that the most important thing was the elimination of the former President in the fresh electoral battle,” Wickramasinghe said, even though the Marxist party had failed to secure a seat in the district. The activist said that yesterday’s result reconfirmed President Rajapaksa’s waning popularity throughout the island. “The Kurunegala result particularly showed that he is not that influential anymore,” he explained. But analysts said the former President was unlikely to bow out gracefully after his second electoral blow this year. Professor of Political Science Jayadeva Uyangoda told Daily FT, Rajapaksa’s continued role in Sri Lankan politics could not be ruled out. “Mahinda Rajapaksa can’t afford to be out of politics,” Professor Uyangoda said. “For one thing, he is an intensely political animal. For another thing the Government is going to continue the investigations into allegations of corruption against him and his family – so he will stay in politics and fight it out,” the Political Scientist said. Prof. Uyangoda said the power struggle between President Sirisena and Rajapaksa would continue if the latter remained in Parliament, with both men having proven their unwillingness to compromise with each other. “The SLFP will remain in crisis,” he said.